At the top of Monday’s CBS "Early Show" a full six minutes of coverage was devoted to Barack Obama’s world tour, while only three minutes was given to a John McCain interview. During the interview with McCain, co-host Harry Smith wondered: "You know, when you have the network anchors chasing your opponent across the Middle East it's a little hard to make news. What is your strategy to get folks to pay attention to your message over the next couple of days?" Co-host Maggie Rodriguez asked a similar question to Republican pollster Frank Luntz on Friday: "Can John McCain even compete next week?" The coverage of Obama consisted of co-host Julie Chen talking to New York Times Baghdad correspondent Richard Oppel, followed by a clip of CBS correspondent Lara Logan’s interview with Obama in Afghanistan. Oppel highlighted recent news of Iraqi Prime Minister Nouri al Maliki supporting Obama’s troop withdrawal plan: "...he was quoted accurately. He did express a clear affinity for Obama's 16 month proposal." Later, when interviewing McCain, Harry Smith also brought up Maliki’s comments: "But one of the other things that -- one of the other things that he [Obama] has said is that maybe the troops should be out within the next 18 months, an idea that Prime Minister Al Maliki basically agrees with. Maybe the surge, in fact, did work. Is it time for American troops to start coming home?" 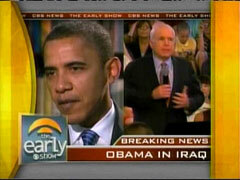 That statement was in response to McCain pointing out to Smith that: "We are winning the war. And Senator Obama was wrong. He railed against it. He voted against the surge. And he said it would fail. He was wrong there." Well, Senator Obama told us that he'd been talking to U.S. commanders and Afghan leaders on the ground here in Afghanistan. And his assessment of the situation is that it's precarious and urgent and requires immediate action...Senator Obama told us more U.S. troops would only be part of the solution. And an Obama Administration would make pressing Pakistan a priority, pushing the government there to get more serious about clamping down on Al Qaeda and Taliban extremists operating out of its remote tribal areas.